Click here to download the full, detailed report. "If all 1040-Schedule A deductions, including the mortgage interest deduction are capped at about $35,000, then homeowners with houses priced north of $500,000 would be the ones primarily affected, and their homes would fall in value. Interestingly, they might respond by reducing charitable giving. If, however, the deductible amount is limited to 80% of total deductions, then all itemizers would be hurt, and many more houses would decline in price." 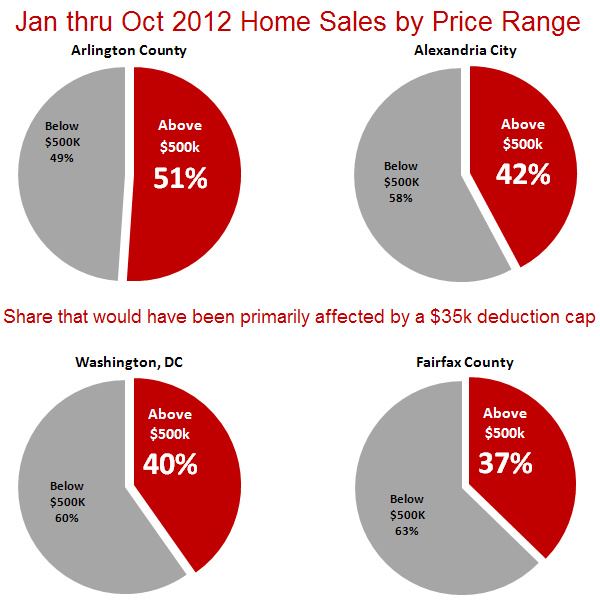 How many of the homes sold (year-to-date) in key DC Metro areas would have been impacted by a $35,000 mortgage interest deduction cap? Might be a good time for area homeowners to give their local congressman a ring! Demand has picked back up in the Washington DC metro housing market in October following a typical September slow down. Sales, new pending contracts, and median price gains are all above their 10-year average change from last month, an indication that buyers are still active in the market. All market indicators are above last years levels, and many are at multi-year October highs. The mild temperatures experienced in October could be playing a role as evidenced by a 7-year high for new pending contracts. Buyers appear to be drawn towards townhomes and condo units, as the proportion of new contracts on single-family homes is the lowest it has been in 2 years. This could be due to the lower price points of these properties as well as location preferences of the active buyer market. Median prices are up in the region, posting the highest year-over-year price gain in nearly 7 years.